Found8tion offers the one of the best locations in Sunnyvale. 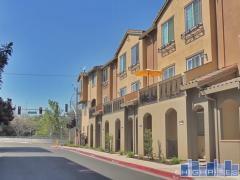 This new Sunnyvale townhouse community, consisting of 3-4 bedroom townhomes ranging from 1,456 sq. ft. to 1,932 sq. ft. Owners enjoy their own community park and the area is host to the best schools, technology companies, and start ups. The Found8tion was built by Taylor Morrison who completed construction and sales of this community as of July 2018. Have any comments or questions about Found8tion? Ask your question and/or share your thoughts about this Building.